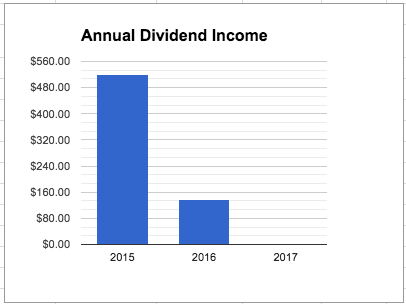 With a third down in 2016, I have collected $148.74 in dividend income! This month I received income from SIX different sources. 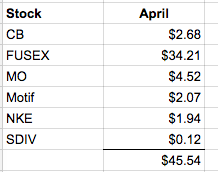 Compared to 2015 my dividends in March actually decreased by 10.43% because of various changes I have made in my portfolio since last year. Next year I see myself growing from this amount without a doubt. See More Charts below thanks to my friend at Two Investing. If you have not visited his site yet, I strongly recommend you do so. I found his Dividend Spreadsheet extremely useful. The Screenshots below are from his workbook, which give a good overview of the direction I am headed in. 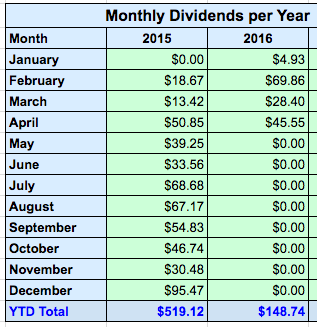 Continuing to fight towards my goal of $750 in dividends this year! Slow and Steady! Nice job. Even though April was down, previous months were up. 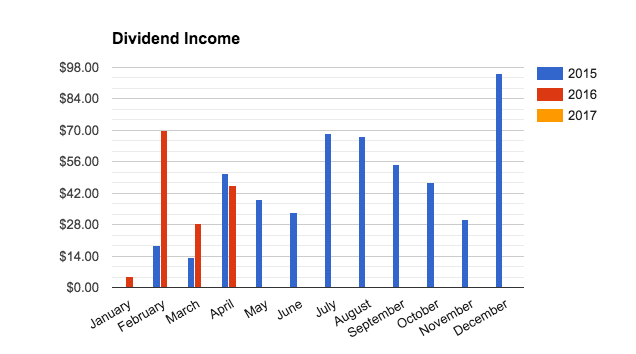 It looks like you'll pass your 2015 annual dividend income. Keep up the good work. Thank you - little disappointing there was a down month, but a lot of this is due to changes in my portfolio since then. Not only will this process help me become invested in great companies, but I hope for it to even out my earnings over the months. That is the one big downfall I see from me investing in mutual funds and ETFs such as FUSEX (S&P 500 fund) and VYM (Vanguards High Dividend Yield ETF). Each contain hundreds of companies, but investing in individual companies allows us to pick them when we think they are trading at a discount or believe they are better than the other companies in the funds. Thanks for sharing Mogul. You're gonna hit your goals for sure. Keep it up and don't look back. Cheers bud. Thanks Dividend Hustler! Hope I can make it to $750 this year! Congrats on your dividend income for April. 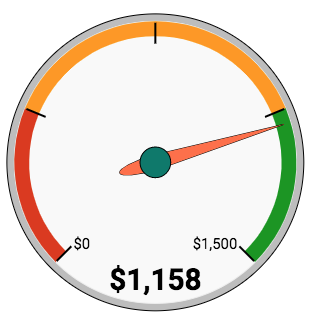 As you said, slow and steady will get you to your 2016 total dividend goal. I see we have CB in common paying us both. Thanks for sharing. CB is a great company and glad we are both invested in it! Nice job Mogul! Can't complain about making money! Nothing wrong with a little restructuring. Just did the same to rebalance my portfolio a bit. Learn and get better. Keep up the good work! Slowly getting the portfolio to where I want it, and getting out of some growth positions.